Antmee: A post about "Something" while I do "Something" else..
A post about "Something" while I do "Something" else.. I am making some bags at the moment but haven't any photos to show. Not even WIP pics. But I took a few pics of this great shopping bag my mum made me. Do you remember "Quillows"? This bag is like those. You fold them up in a certain way then tuck it all inside a pocket and ta da! Well I folded and folded and then had to ask mum for the folding instructions! I am no good at refolding maps either! Which is bad because I work in tourism and there are always maps to be opened and shown to clients. I usually throw the opened map behind the counter if the client doesn't want to keep it and then I refold it when they have gone (haha). They usually do want to keep said map and I then have to try and fold in front of them. Not a very professional sight I can tell you. Everyone gets a laugh though, so its ok.
Close up of embroidery. Isn't my mum clever! 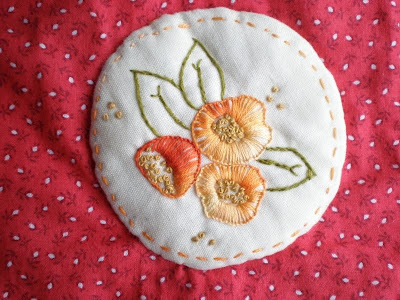 I think I got my love for embroidery from seeing my mum's beautiful work. You have such a sweet mom! Your Mum is very clever...such neat work and what a clever idea. You are one very lucky girl. 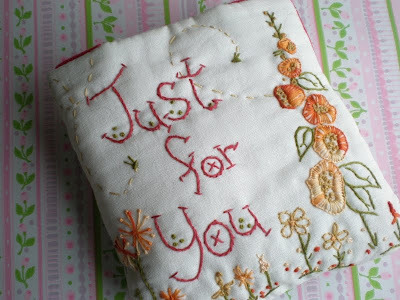 Such a wonderful gift with gorgeous embroidery. 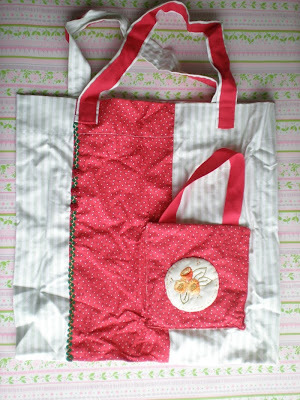 oooh I came looking for the shopping bag when you mentioned it on my blog - and its lovely! What gorgeous embroidery :) I'm excited to get my dolls done too! You do beautiful work, dear. I enjoy your blog.